Zippora Karz is a former soloist ballerina with the New York City Ballet where she performed for 16 years on stage and in televised performances. She was featured in a variety of roles choreographed by George Balanchine and Jerome Robbins as well as works choreographed for her by such choreographers as Peter Martins and Lynne Taylor Corbett.Miss Karz danced with the New York City Ballet from 1983 through 1999. She now serves as a teacher and repetiteur for the George Balanchine Trust, rehearsing and staging Balanchine’s choreography for a host of national and international dance companies. She is also a diabetes spokesperson and educator who regularly addresses major diabetes conferences and organizations worldwide. Zippora’s memoir “The Sugarless Plum” has inspired people all over the world to live happy and healthy lives. “The Sugarless Plum” is now translated in Slovenian. 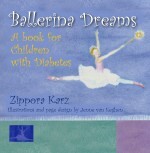 Zippora also authored a children’s book, “Ballerina Dreams.” The story teaches children, with and without Diabetes, that they should not give up on their dreams no matter what challenges they face. She is currently guest faculty at the prestigious Colburn Dance Academy in Los, Angeles, Cal., as well as, an artist in residence at the University of Southern California Glorya Kaufman School of Dance. Zippora hopes to continue to inspire people to live healthy active lives through her work as an author, teacher, and motivational speaker.